If books have social lives – if their value and meanings are conditioned on the ways that we interact with them – can we imagine what it means for such a life to end? Kerry Mansfield’s Expired is an elegy for books that have been retired, withdrawn from libraries. Her photographs of the books are descriptive - front, back, spine, inside covers and inside pages - but they are understood better as a portrait gallery than as a typological study. Mansfield sets out to convey that each book has traveled a unique path through the world, and she accomplishes this with a simple, clever, effective strategy: she visualizes them in a way that removes them from the world entirely, in a photographic limbo that does nothing less than invite us to consider an expired book as a metaphor for the relationship between body and soul. The books in Expired date from the 1930s to the 1980s. Many come from school libraries. Some of the titles are still with us, even if the editions are not, like Hop on Pop, Twenty Thousand Leagues Under The Sea, and The Velveteen Rabbit. 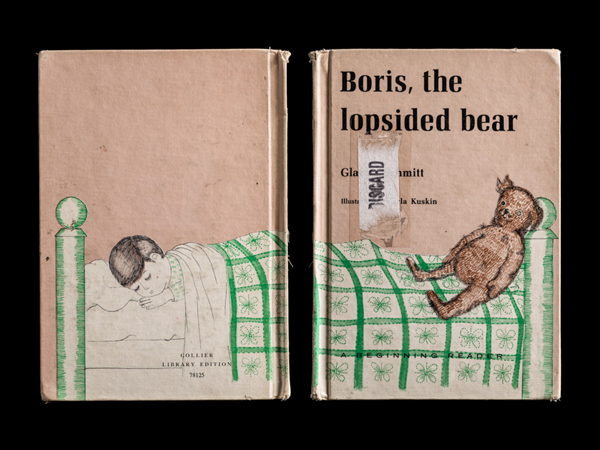 But Boris the Lopsided Bear is long out of print, as is Vardis Fisher’s 1936 No Villain Need Be, clearly very popular throughout the 1940s, as evidenced by its checkout stamps. 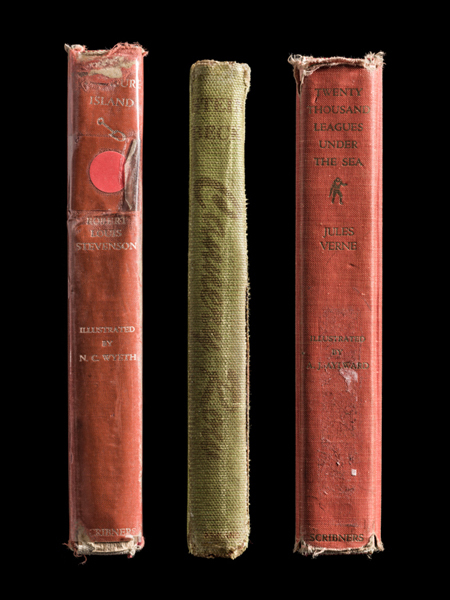 The books have the feel of the past, in their design and material (sometimes revealed in the photographs in split covers), in their typography, binding, and proportions. Books make compelling photographic subjects. Like people, there’s a tension between how they appear as things and what they contain, and what they’ve meant to others - between what’s visible and what is not. The shell shouldn’t matter, but it does. A book is a physical vehicle for some world of immaterial ideas contained within, and sometimes the essence of a book – its value to an individual - can be known by reflecting on one’s extended interactions with its body. Every book is unique, even if mass-produced; each copy has made its own way through the world and gathered marks and scars. We value books not only for what their content gives us, but for how individual books fit into our lives, our own histories. First pages are creased by fingers trying to gauge the weight of the paper, corners are dulled by repeated impacts over time. The title page of Mystery Tales for Boys and Girls bears witness to the declaration “Debbie Wallace + Mike Messic.” Lad: A Dog appears to have been punctured by canine teeth. History is embedded in the inscribed records stamped onto checkout cards, and the cursive signatures of children who borrowed the books, the interface between people and institutions, agreements to return books on time or face a fine, no computer, no database, no barcode, just these date stamps. Like vanitas paintings, Mansfield’s photographs revel in the physicality of their subjects while also visualizing them receding from the world. Their demise is not due to violence or decay, but to receding significance, and as such the details do appear as vanities: the embossed covers, the titles that indicate a timeless relevance (The Family Treasure of Children’s Stories, The History of Ancient Art). Nearly everything about these books – the stories, the design, the cursive of the borrowers, the checkout cards– has been replaced by newer styles and forms. The old books seem vulnerable, irrelevant. If the wear and institutional markers on the books are indices of their social life, the manner in which they are photographed in Expired contemplates their afterlife. A transfiguration has taken place, where Mansfield has removed the books both from their original contexts as library books, borrowed and read, but also from their current context, stockpiled in warehouses of expired books. Surrounded by an airless digital black, the books are nowhere; they are in a void. They aren’t in darkness; they aren’t in any kind of space at all. Sometimes we see the front and back covers together side by side, a composite that suggests that we are seeing the object not as something to be seen, but something to be known. And, sometimes we see the books at an angle, still isolated in blackness but soaked in gorgeous light. The light humbles the book- it is just an expired thing after all – and at the same time glorifies it for having been at all.